Land Rover’s flagship model, the Range Rover has been about for some forty five years or so now and has always been known for raising the bar when it comes to luxury, comfort and off road ability. The initial models released back in the early seventies however were far from luxurious; in fact they were quite agricultural by today’s standards and served a purpose, a purpose of lugging loads, animals and royalty about an estate, over a plateau or through rivers. A notable adventure highlighting just how capable the early Range Rover was off road was the 1972 British Trans-Americas Expedition where specially modified Range Rovers became the first vehicle based expedition to traverse the Americas from North to South including the road less Darien Gap. This off road ability, over the years was combined with the luxury that we all know Range Rovers for today and despite the general silhouette remaining pretty similar throughout the last four decades the Range Rover has smoothed and curved itself into modern day life, not only in looks but with technology too. Thanks to the hard work of Colin McNab (Group Operations Director) and his huge team at Charles Hurst Belfast we are able to give you a taste of what the latest Range Rover Autobiography is like on and off road with thanks to David Craig and Jason O’Neill in Land Rover Belfast as well as Walter Corr at Ireland Off Road Experience within Clandeboye Estate. 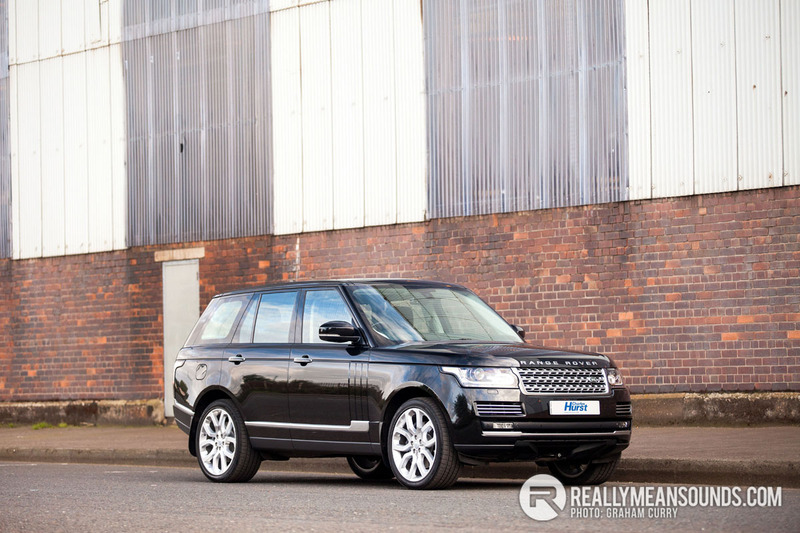 I could make this review exceptionally short by telling you a basic opinion on the latest Range Rover which is as follows; “I have never driven anything at all like it, on or off road it’s simply outstanding and unstoppable with a price tag of a small Bungalow and more toys than Hamley’s in London”. However this just wouldn’t suffice so as I sup my coffee I will ramble on with my views, good and well good as there isn’t much bad that can be said for this particular model and anything that did niggle me are all available as options so for me personally there is nothing I can really criticise other than the limited practicality in a city due to its sheer size. First impressions are good, Land Rover’s design team have certainly brought the instantly recognisable shape right up to date with smoother lines, more curves and lighting that wraps onto the wings and quarters beautifully. With this new styling comes weight reduction with the use of masses of aluminium shaving just shy of half a ton off the new model and adding a 3 litre v6 diesel into the range which should keep the tree huggers happy with its stop|start ability. Two other engines are available a 5 litre supercharged petrol and a 4.4 v8 diesel as per the model we tested. These three engines are all matted to a 4×4 drive system via a super smooth eight speed automatic gearbox and combined with the exceptionally smart “Terrain Response 2” system which allows driver to select differing modes depending what sort of terrain they are driving over will carry itself and occupants safely anywhere. By anywhere I really do mean “anywhere”! On collection of this car from Charles Hurst, the rain was heavy and there was no way I was going to get anything nice and clean in the way of imagery by the time I got back to Bangor so it was only right that I stopped off with Walter at Ireland Off Road Experience on my way past to see just how capable a Range Rover is off road. In my years of doing this work I always thought, maybe in my naivety that the only off road vehicle that was truly unstoppable was a Land Rover Defender. How wrong was I though, I can honestly say that despite hearing for years that the Range Rover was as capable I never let myself believe it. Let’s be honest, if you spend just shy of £100k on a Range Rover with more hide than an abattoir, more gadgets than Q from the Bond movies could dream of and as much luxury as a five star private resort you’re not really ever going to have it on terrain much worse than a grass field with a horse box on tow. However when the air suspension is raised to it’s off road height setting and it was taken into the woods of Clandeboye Estate I was completely blown away by the agility of this beast, even on 22 inch wheels with low profile road tyres there was no hill to steep or river too deep for the Range Rover to fall foul of, it just wafted along with ease. Ease for the vehicle and also the occupants I must add as the heated massaging seats up front with heated rear seats and full shag pile carpets with on board fridge most certainly made being in the Range Rover an absolute pleasure. A pleasure that by nightfall was one of star gazing with its full size panoramic roof with electric blind and a highlight for me inside was the mood lighting in all the door pockets and around the centre consol which wrapped into the rear passengers controls, this lighting was colour changeable and softened what already is a very relaxing cockpit. The AV system is one that I still haven’t got my head around however, whilst out for a drive with my wife I was following the sat nav and listening to the ever eclectic Radio 6 Music as per usual but the part that I can’t get my head around is the fact that the good lady was in the passenger seat watching ITV2 and listening to said channel with wireless headphones. This two way viewable screen means that the driver stays within the law and cannot physically watch TV but the passenger can and either the whole car can listen to the audio from the channel or it can be switched to the wireless headphones. Mind boggling to me and hats off to the electronic wizards that have developed such a system. Whilst on the screen there are more camera’s on this Range Rover than in the Bog Brother house with two up front watching left and right when your pulling out from a blind junction, one looking down from each mirror for parking and a rear camera for parking and trailer hook up, all accessible live when on the move via the touch screen. The inside space for 5 grown adults is mega, its hugely spacious and comfortable. On the road it drives extremely well, it’s a heavy brute and you feel this when braking however it doesn’t hang about at all when accelerating. Handling wise it maybe isn’t the best in its class however there is nothing in the class that would be as smooth to drive and as comfortable in all conditions over all terrain. The Range Rover really is in a league of its own and way ahead of its rivals, I have driven supercars, sports cars, family saloons and luxury barges but I can hand on heart say that the Range Rover is the best all round vehicle I have had the experience of reviewing and for that well done for staying ahead of the game Land Rover! Let me know when, and we can maybe go for a joint venture! Lovely machine. Thought I was going to buy one today but alas, the "new about my ticket" was a £25 win, so I may keep saving!